Madison College women’s soccer player Arianna Viscarra, center, splits a pair of defenders during a recent home game against the College of DuPage. The WolfPack’s season ended on Oct. 24 with a 3-0 loss to the DuPage in the NJCAA Region IV Tournament semifinals. A winning season for the Madison College women’s soccer team came to an end on Oct. 24 with a 3-0 loss to the College of DuPage in the NJCAA Region IV Semifinals. It marked the third time this year that the College of DuPage had beaten Madison College. DuPage had claimed the North Central Community College Conference title this year with a 10-0 record. In the playoff game, Madison College gave up two goals in the first 20 minutes and the allowed another midway through the second half. DuPage out-shot Madison College, 14-6, in the game. Madison College finished its second full season as a varsity squad with an 8-7-1 overall record and a 4-5-1 conference record. Madison College opened the NJCAA Region IV Tournament with its third-straight victory over Joliet Junior College this season, 4-1, at home on Oct. 20. Tynia Goldensoph had her second hat trick of her career to push her season goals total to 13. She had two goals in the first half and added one more in the second half. 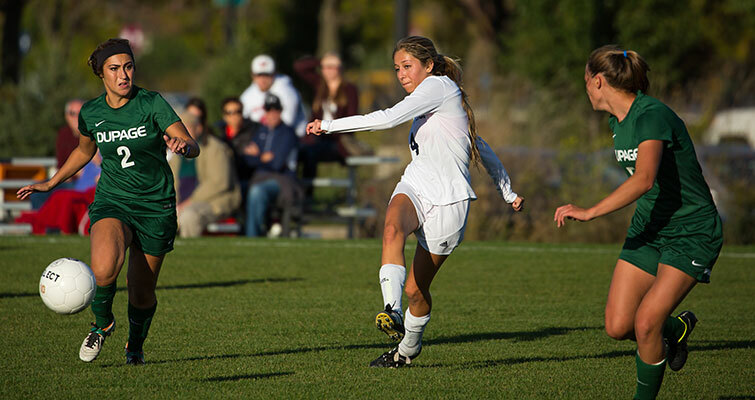 Jamie Hess scored the team’s other goal in the second half, off of a pass from Goldensoph. For Hess, it was her third goal of the season. A goal by Arianna Viscarra was enough to give Madison College a 1-0 victory over Harper College in its final match of the regular season. The win put Madison College’s conference record at 4-5-1, good for fourth place in the North Central Community College Conference. Goaltender Lindsay Hamilton denied seven shots on goal to record her second shutout of the season. Hamilton finished the regular season with 95 total saves.